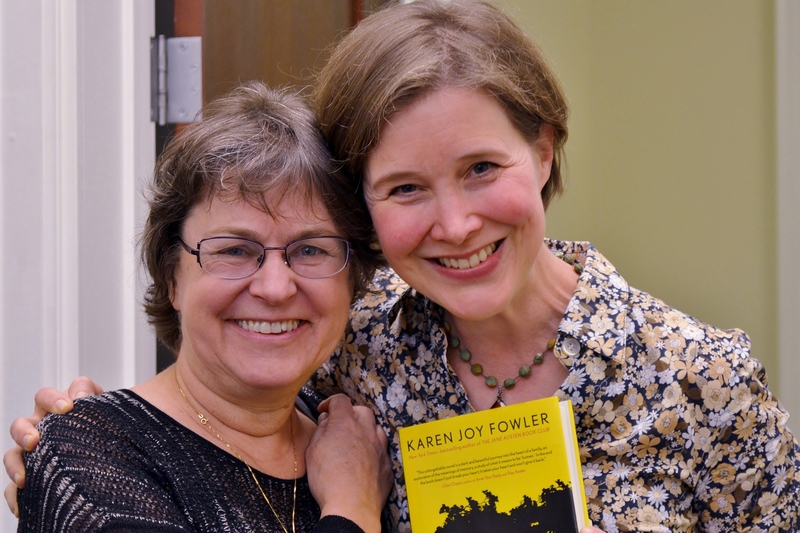 Good news first — Nashville Reads did a terrific job this year with Karen Joy Fowler’s We Are All Completely Beside Ourselves. We’ve had great discussions about the book in anticipation of her visit, and a wonderful event at the library once she got here. It’s certainly the book I’ve been recommending to everyone this year. The icing on the cake to this very successful pick was that Karen got the news that the book won the PEN/Faulkner Award just before she left Nashville! We were all completely beside ourselves. The prize couldn’t have gone to a better book or a nicer person. Congratulations, Karen! And thanks to everyone who did such a great job making Nashville Reads a success. Sometimes when I have a cold I’ll be hungry but everything I eat tastes like nickels. I feel certain the right food is out there, I just can’t figure out what it is. Books can be like that too. Believe me, there is no shortage of reading material in my house, and yet there are times when nothing seems right. I pick up a book, flip through a few pages, put it down. I do this again and again, sometimes dismissing as many as 15 books in a day. I know that many of these books are good but, well, none of them is right, or they aren’t right for right now. Maybe I should just read We Are All Completely Beside Ourselves again. I go to the bookstore, look around, read flap copy, but I can’t seem to make a connection. I found a fabulous children’s book about a sloth called Sparky! but I finished it in four minutes, then I was right back where I started. Not reading is an unnatural state for me, in the same way not eating is an unnatural state. The fact that I’m not reading just makes me feel more adrift. Still, this is where I found myself recently. As I mentioned in the last book report, my brother-in-law Bill died at the end of January, and the ensuing sadness left me unable to read much more than a book about a sloth. I was desperate for a book to love. I wanted to fall into another world, but everything I picked up felt trivial when compared to the world I was in. That’s when my friend Nancy Pearl suggested I read The Suicide Index by Joan Wickersham. No, I said, judging the book by its title. A book that was going to make me sadder wasn’t the answer. But Nancy persisted gently. She said I should at least give it a try. Getting a book recommendation from America’s most famous librarian and NPR guru is no small thing. Plus Nancy is brilliant and deeply kind, the best kind of reader, and so I took a leap of faith. I bought the book. Three weeks later, I was in Indianapolis speaking at the Public Library Association. While I was on stage, I started telling the story about Nancy Pearl and The Suicide Index. (If you want to impress a group of librarians, tell them you’re friends with Nancy Pearl. They gasp.) As is so often the case, I didn’t really understand what had happened until I was telling the story — Nancy had saved me by giving me the right book. It told the completely engrossing story of Joan Wickersham’s father, who had shot himself without warning, reason, or note, when he was 61. It was a book I couldn’t put down, and that was what I really needed — to be swept up again. I was able to lose myself in Joan Wickersham’s beautiful writing and piercing insights. Not only did I love the book, but it restored me to myself as a reader. I told my sister she needed to read it. Not a chance, she said. Like me, she said she wasn’t in the market for anything that was going to make her sadder. But The Suicide Index hadn’t made me sad. It had restored me. Following Nancy’s example, I gently persisted, and so my sister read the book, and told me it was exactly what she needed. She asked me for three more copies to send to friends. We got our mother to read it. We were all so thrilled to have a book that could take us over, a book we could be fascinated by. As for the book being sad, well, sometimes sad is exactly right. I also read Jesmyn Ward’s memoir Men We Reaped, about five young men in the small Mississippi town she came from who all died within a four year period, all in their early 20s. I was a big fan of her novel Salvage the Bones, which won the National Book Award last year, but I liked this one even better. Whether we’re librarians or book sellers or serious readers, we all know what a gift it is to connect a person to the book they need, the book they may not think they want. When you do that, you feel a sense of real accomplishment. So I want to thank Nancy Pearl, but I also want to thank Joan Wickersham. I was so wrapped up in The Suicide Index that when I was finished I went immediately to her collection of stories, The News from Spain. Once again, I found a book I couldn’t put down. The seven stories in this mesmerizing collection aren’t interconnected but they’re all called “The News from Spain.” It’s a clever trick, and it works to a powerful effect. I know it’s barely spring, but I’m ready to say that Joan Wickersham is going to be my favorite writer in 2014. My sister and mother, who also devoured The News from Spain, agree. So what’s the moral of this story? Take the advice of someone who has a great book to recommend, even if you’re not so sure it’s the right book for you. Read outside your comfort zone every now and then, and don’t judge a book by its title OR its cover. You may be surprised by what’s waiting for you. One of the reasons I so love speaking to groups of librarians is that they’re such passionate readers. They’re always looking for the next great book. And that works for me, since one of the next great books is called The Public Library. For the past 18 years, Robert Dawson has taken pictures of America’s libraries — libraries in trailers and shacks to libraries in strip malls to the grandest libraries our country has to offer. Filled with moving essays by Bill Moyers and Anne Lamott and Barbara Kingsolver (and me), this is a spectacular book for anyone who loves books or libraries or great photography or great writing. It also has the unexpected benefit of being a wonderful portrait of America. Here’s a little snippet from an essay in the book by the 8-year-old Amy Tan. The essay won a contest sponsored by the Citizens Committee for the Santa Rosa (California) Library. Her prize was a transistor radio. What more could possibly be said? Spring is a perfect season for reading. Come and see us at Parnassus. Availability: THIS BOOK IS OUT OF STOCK INDEFINITELY AT THE PUBLISHER. WE WILL UPDATE THIS LISTING WHEN WE RECEIVE WORD OTHERWISE.